October 2016 found us outside Birmingham Cathedral, collecting signatures in costumes –courtesy of BFOE volunteers. We also headed off to the Fossil Free Network Gathering .This was an inspiring weekend with lots of support for the campaign. WMPF is being pooled with eight funds forming the Central Pool. We began to consider the challenges and opportunities this brings with a campaigner from Divest Shropshire. In November at the ‘Tread Lightly on this Earth’ conference we gave a brief introduction to Divest WMPF which was well received. We continue to build these important links with faith communities. In March we delivered a talk at the West Midands FOE Regional Gathering, gaining a new member for our team. Leading up to the Mayoral election we asked candidates to speak out in favour of a fossil free West Midlands and commit to “take all possible steps to divest the West Midlands Pension Fund of its investments in fossil-fuel industries.” At time of writing one candidate has made the commitment whilst another backed gradual transition to a Fossil Free West Midlands. We expect responses imminently from the other three candidates. Divest WMPF was invited to campaign at Birmingham Flat Pack Festival in April, where our new badges and postcards were a great way to build public support. Also in April we were involved in a training event hosted by 350.org.This was aimed at building local campaigns through learning about creative actions, tactics and strategy. 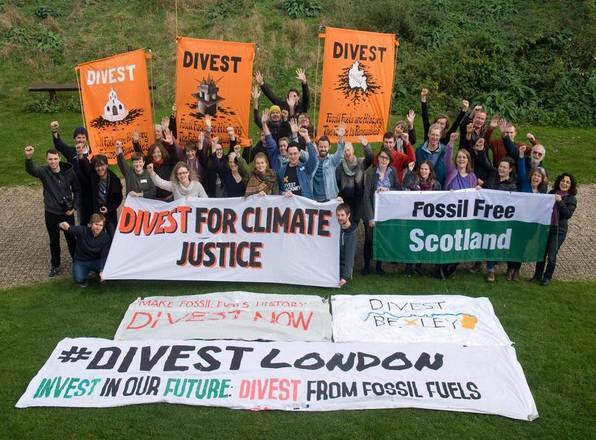 For the Global Divestment Mobilisation in May we are organising two events to highlight climate impacts and the need to break ties with fossil fuel companies. These will target WMPF and Birmingham City Council to build momentum for divestment. As part of the Divestment Mobilisation aimed at WMPF (based in Wolverhampton) we will present the Pension’s Committee with a letter explaining the developments of the last year. Following this we will be pursuing the opportunity to speak at a Committee meeting. We continue to lobby Birmingham City Council. At present we have received support from Councillors from the Lib Dem and Labour groups. A motion is hoped to be raised in June.